What does it mean to be Ukrainian? Alfred Rieber, author of The Struggle for the Eurasian Borderlands, explains why Ukraine's history as a contested borderland continues to shape its politics today. Ukraine, Bosnia, Ossetia, Nagorno-Karabakh, Kurdistan, Afghanistan, Xinjiang — the “hot spots” of the past ten years were little known to most Americans before conflicts flared up and caught the attention of the media. What do they have in common? On a current day map they seem widely separated. But on a historical map of a hundred years ago they all figured as borderlands of great continental empires: the Russian, Habsburg (Austro-Hungarian), Ottoman, Qajar (Iranian) and Qing (Chinese). 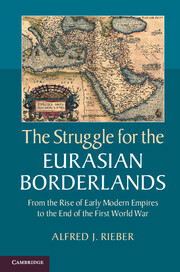 How they became “hot spots” in international conflicts is the subject of this book, Struggle over the Eurasian Borderlands: From the Rise of the Early Modern Empires to the End of the First World War. The borderlands had been conquered over the centuries but had not been entirely assimilated; the subject populations not always subdued. Located on the periphery of the empires, they were also “shatter zones” inhabited by very diverse populations in ethno-linguistic, religious and social terms. Their borders, shaped by war among the empires, divided peoples of like national and religious background — Serbs, Poles, Ukrainians, Armenians, Kurds, Turkmen, Uighurs. What it meant to be “Ukrainian” was not clear until the twentieth century. Ukraine remains a classic case of a contested borderland. As far back as the great Cossack rebellion in the mid-17th century, the lands that comprise Ukraine today were caught up in a fierce rivalry between Poland, Russia and the Ottoman Empire. The treaty which finally attached part of Ukraine to Russia in 1654 is just as hotly contested by historians who have offered eleven different explanations of the constitutional structure it created. Since that time, large scale immigration brought in Serbs, Bulgarian and German colonists to add to the rich ethnic diversity of Poles, Jews, Russians and Ukrainians. What it meant to be “Ukrainian” was not clear until the twentieth century. Even then, questions of identity remained disputed, as they continue to be today. When the Russian Empire disintegration in war and revolution in 1917-18, Ukraine was plunged into a civil war between Reds, Whites (both mainly Russian) Greens (anarchists), Grays (Cossacks) and Ukrainian nationalists; terrible pogroms of Jews were committed by all sides. At the same time, foreign intervention first by Germans, Austrians and Turks and then by British and French fed the turmoil. The scars of these conflicts were re-opened during the Second World War when once again Ukraine was wracked by civil war, foreign intervention by German and Rumanian armies and the Holocaust. These are some of the historical memories that are evoked in the current crisis as Ukrainians continue to struggle with the nature and boundaries of the state, the politics of identity and the pressure of external forces. The outcome now, as in the midst of past crises, is not easily predictable. But those involved in trying to resolve the questions both inside and outside the country, will have to take into account the complex history of the region, which still deeply affects the way Ukrainians live and feel, if a peaceful solution can be reached.